Eres Books has enrolled all my novels in the Read an eBook Week kicking off on Sunday, March 3, 2013. Both the first book of the Tywi series, Traitor’s Daughter (a best seller at All Romance eBooks with 4 and 5 star reviews on Amazon), and the first two books of the Pendyffryn: The Conquerors series will be offered at a 50% discount. Just search for the book’s page and the discount code will be near the top of the page, on the right, opposite the cover image. The code for these three books is REW50 and is valid until midnight, March 9th, 2013. With Betrayal, Book 3 of Pendyffryn: The Conquerors launching in just 15 days, you can start your collection of this Welsh medieval romance series at half the retail price: the first two books for the price of one. Salvation, Book 2: Pendyffryn: The Conquerors is also a best seller at All Romance eBooks. Not yet a Smashwords reader, author or publisher? Sign up before or during the sale to take advantage of this opportunity. All of my novels are available on the iBookstore as well as all major online retailers. “The best of men… the most treacherous of lovers.” Betrayal will be released on March 17th, 2013. This is the third novel in the Pendyffryn: The Conquerors 5-book series. 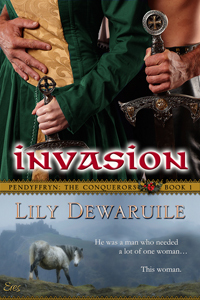 Betrayal returns to Gwennan and the invader who captured her heart. Now only known by the name she gave him, Ieuan Emyr must find a way to survive and keep his wife’s love. Neither will be without complications while his former employer threatens to take all Ieuan has fought to gain for his children. Only days after her marriage to the invader, once known as Jehan-Emíl deFreveille, his mistress, Charlotte de Guidry, reveals a secret that devastates Gwennan’s confidence in her husband. Her unhappiness threatens her life and those of her friends. Betrayal will be available on Smashwords and shortly after its publication will join Invasion and Salvation on the iBookstore, All Romance eBooks, Barnes & Noble, Kobo, Diesel and Sony. I am proud to announce the first book of the Pendyffryn: The Conquerors series will be published in a few days’ time. Invasion has undergone a few transformations since I began work on the romance, a few years after my first encounter with Cymru (Wales). I so fell in love with the country that I began to write before I knew much of the history between the Cymry and the Saeson. Invasion is a work of the imagination, in spirit with the forces and passions that existed in the early years of co-existence between the invaders and the Celtic people who had made Briton their home. Many thanks to Hot Damn Designs for their stunning work on the covers of the first three books in this five-book series.